I stopped writing on this blog almost 5 years ago. 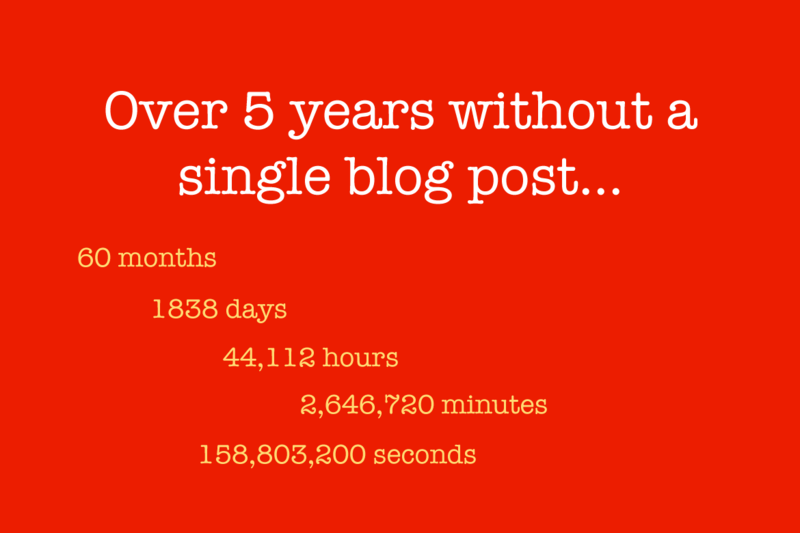 I was blogging quite a bit in a phase of my life where I had lots to process. Writing helped me to clear my head and stay focused. A small audience of friends was interested in what I had to share. My blog was always separate from my professional life and never had any commercial purpose. 1. It was easy to share shorter snippets on Facebook. 2. WordPress has gotten more complicated to maintain over time and I began to fall behind in terms of design and maintenance. 3. I had other priorities in my life. The things that dominated my life did not belong here. I’m obviously writing again. So what has changed? 1. Facebook has officially turned into an abusive big brother that many friends of mine have already left. I’ve had my suspicions and opinions about Mr. Zuckerberg and friends for quite some time. I’m certainly intending to be less present in FB without the intension to abandon it all together. I will mention new blog posts occasionally. 3. I’m full of ideas that have to go somewhere in order t receive feedback. As I mentioned above FB does not seem like the proper outlet. From my perspective a self controlled environment is the proper platform for any substantial form of content. Not something that is controlled by another party and is in essence just a rented playground that could disappear any time. Some old same old or shift in focus? I want to talk about my passions, future projects and other aspects of my life. I don’t expect a lot of traffic or comments. I’m not using any plugins that will promote this blog or push it in front of people’s eyes. Hopefully there will be some conversation leading to a few actionable items. The focus of this blog will shift a little since I’m planning to write a bit less about myself and more about my passions and ideas for future projects. The old posts will stay up. Many of them document a crucial phase of my life that lead me to where I am today. I never really tried to sugarcoat anything and that certainly won’t change. So there you have it. The 1st blog post in over 5 years.